There are two basic types of plastic closures used for scientific applications: Thermoset (Bakelite) and thermoplastic (polypropylene). Thermoset closures cannot be remelted after they are formed. They provide the widest range of chemical compatibility and they exhibit the most tolerance to temperature of all plastic closures. 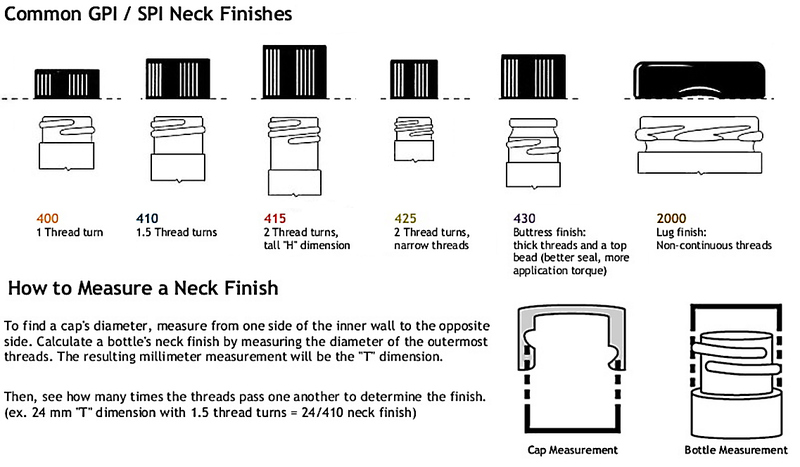 Because thermoset closures are rigid, they provide the most consistent adherence to close dimensional tolerances. Phenolic is short for Phenol Formaldehyde Resin (PF). At 220°C (428°F) or above, Phenolic caps will start to decompose. However, due to their non-chemically reactive nature, when exposed to corrosive or harmful chemicals over time, phenolic caps will not give out the way other polymers might. They're very tough when used in the correct temperature range. Thermoplastics can be remelted after initially formed. Polypropylene caps are known for good impact strength, cost effectiveness, and pliability. Polypropylene is autoclavable and polyethylene is not. Polypropylene can withstand high temperatures (it's melting point is 130°C), but is less suitable for freezing temperatures where it can become brittle. The melting point for polyethylene is 115–135 °C and it is best for option freezing temperatures. Metal Closures offer the widest range of temperature tolerances and are very resistant to fracture from impact. A metal closure is manufactured from either steel (coated with anti-corrosive coating of either chromeplate or tinplate) or aluminum. F217 & Teflon® Lined Caps with Foam backed Teflon® PTFE liners resist attack from virtually all chemicals at room temperature and provides resilience for a tight seal with a low moisture transmission rate. F217 has a low density foam core between two solid layers of LDPE. Uses include: Analytical lab samples, high purity chemicals, strong acids, solvents, environmental samples, pharmaceuticals, and diagnostic reagents. The color green easily identifies the Teflon® liner system. Available in Thermoset and Phenolic caps. Pulp/Vinyl Lined Caps: Perfect for general use. The liner is made of a vinyl coating applied to high density polyethylene coated paper and then it is laminated to pulpboard. This general purpose liner is commonly used for food, beverage, medical and chemical applications packed at less than 120° F., including mild acids, alkalis, solvents, alcohols, oils and aqueous products; not recommended for active hydrocarbons or bleaches. Rubber Lined Caps: Black phenolic caps with rubber liners are autoclavable. This liner is FDA approved for food and pharmaceutical applications. Excellent properties of resilience, resistance to moisture vapor and relatively low gas transmission. Also widely used for packaging injectables. Great for culture work. They also provide the most consistent adherence to close dimensional tolerances. Available in Phenolic caps. Aluminum Foil Lined Caps: These caps are typically used for food applications. Free of odor and taste problems. Also can be used for non-acid, non-alkaline products. Great for organic solvents, chrome cleaners, brake fluids and mineral oils. Available in Phenolic and Metal caps. Polyseal® Cone Lined Caps: These caps form an exceptionally tight seal and offer a good chemical barrier. This liner molds itself around the sealing areas of the finish as the cap is screwed on, virtually eliminating leakage, evaporation, contamination, binding and backing off. Great for everything from liquids, to soaps, to macro-invertebrates. Available in Phenolic caps. .030 Solid Polyethylene Lined Caps: Caps with solid PE liners offer good chemical resistance and low moisture vapor transmission rate and is great for nail polish remover and higher concentration acids & alkalis. Good for non-oil products filled at room temperature. Because this lining system is paperless, your samples will not be contaminated with fiber or paper particles from the closure. Available in Phenolic caps. Polyethylene (PE) Foam Lined Caps: These polypropylene caps have excellent sealing characteristics and offer good chemical resistance including acids, alcohols, alkalis, aqueous products, cosmetics, household oils and solvents. Rubber Backed/Teflon® Faced Caps: Designed for the ultimate in product safety. Autoclavable PTFE provides totally inert inner seal and surface facing the sample or product. Unlined Caps: Unlined polypropylene closures are available in white or black. These caps are autoclavable and are suitable for many dry products. Teflon PTFE/Silicone Septa: The Teflon® PTFE/Silicone septa resists coring and is recommended when multiple injections are required. This .125" septa has excellent resealing qualities. Plastisol Lined Metal Caps: Metal caps with a Plastisol liner offer excellent resistance to mild acids as in food products. Permits "hot fill" operations to effectively produce a vacuum seal. Pulp/Polyethylene Lined Metal Caps: These metal caps are a great general purpose closure. They are ideal for powders and non-acidic food products and consumer products such as jar candles and honey. ​Is Your HPLC /UPLC Waste Collection OSHA Compliant? CP Lab Safety Inc. Acquires major assets of Chemical Feed Safety Supply Inc.